UCanDanc' African Healing Arts - Kalibu (Welcome)! Thank you for Visiting! Kalibu (Welcome)! Thank you for Visiting! Masankho's mission is to build peace, inspire diversity and inclusion and good governance around the world using a wide variety of modalities. 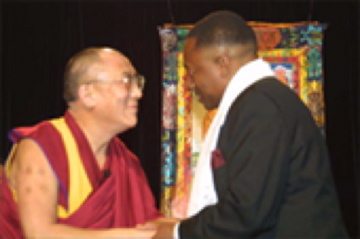 In 2001 Masankho was awarded the Unsung Hero of Compassion award by his Holiness The Dalai Lama. Masankho is ready to come to your community bringing his gift of compassion through stories, drums, music, dance and Interplay for the purpose of building peace, creating harmony, crossing the bridges that divide, inspiring diversity and celebrating individual and community creativity. Invite him to come to your community, It is a decision that you will not regret, actually it is one that you and your Community will celebrate! Copyright UCanDanc' African Healing Arts. All rights reserved.